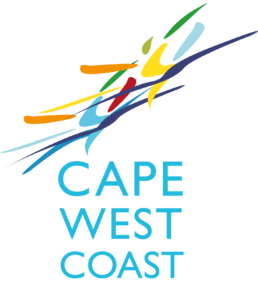 Quay West is a cosy double storey self-catering upmarket (4 star standards) lock up and go holiday home situated in Velddrif Quays close to the Berg River (second row). 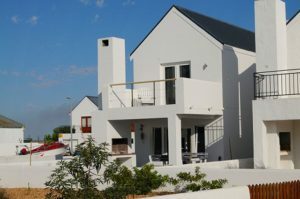 On ground floor is an open plan kitchen with granite counter / dining and lounge area with futon sofa which leads to an outside covered terrace with braai. Here families and friends can enjoy quality time together. The top level hosts the Master bedroom with Queen size bed, separate dressing area and spacious ensuite bathroom with toilet, basin and shower with shower panel. The bedroom leads to comfortable balcony for sunbathing. Equipped with clock radio, ceiling fan, safe and hairdryer. The second bedroom consists of 2 extra lengths single beds which can be converted into King size bed. The small ensuite bathroom has a toilet, basin and shower. The balcony faces limited views onto the Berg River. The “home from home” is fully equipped with LCD-TV (with Easy View Multichoice subscription) dishwasher, washing machine, microwave, fridge/freezer, oven and hob, coffee maker, kettle, toaster, electric blankets in winter. Bring your own iPod and connect to the HiFi for entertainment. In winter time the gas fireplace in lounge will keep you warm. A double kayak is available for you at little extra charge (the Berg River is approx. 40 m away, the jetty approx. 90 m). Please respect that Quay West is a non-smoker house.